Time to focus on just one goal. For example, your goal is individual images of the children. Once we have our goal, we can go for something else like a a family shot if there is time. Minis are for up to 4 immediate family members. For example, 4 children OR a family of 4. They are not just for children. Couples can schedule minis, too! They are a great time to supplement last year's session if you have older children and haven't had a chance to get them photographed this year. Since the nature of minis is short and sweet, they work best when children are old enough to listen to simple directions. Clothing changes and minis don't go together. Families with small children who are not sitting unassisted will need more time than minis allow if they want images of their child alone or with other young children. If you'd like more than 4 immediate family members photographed, booking two minis back to back or a full portrait session is for you. Minis aren't a place to be late. The reason minis are such a great price is because I am able to schedule several at one sitting. We'll need to start each session on time. Do you just sell the disc? I offer many products! I've found the mid-resolution files to be the best value for clients wanting image files or several prints sized 8x10 or smaller. Larger prints and custom items like albums, storyboards and mini books are ordered with me, and I'd love to create an heirloom piece for you. The 2011 holiday order deadline is Sunday, December 4. I don't know how to order pictures! Help! For my clients who purchase image files, I recommend www.mpix.com for their prints. Mpix is easy to use, and I can help if you need it. Mpix is the consumer division of a professional lab, and the quality is excellent. Protect your investment by using a reputable, photographic printer. What about Christmas cards? Don't you do them anymore? Oh, yes! I offer many custom cards for any occasion. I've found most clients scheduling minis wanted more image files instead of fewer files with holiday cards and then they ordered cards separately. Cards are available in several designs and sizes. Everyone who orders cards gets tons of raves on them! Call or email to for more details. What if we have more than 10 pictures? Can I get them all? Yes! Although, in our 20 minute session, a yield of 8-10 images is average. Sometimes, it's 8. Other times, it might be more. If we do have more than 10 and you want them all, mid-res files over 10 are $25 each. 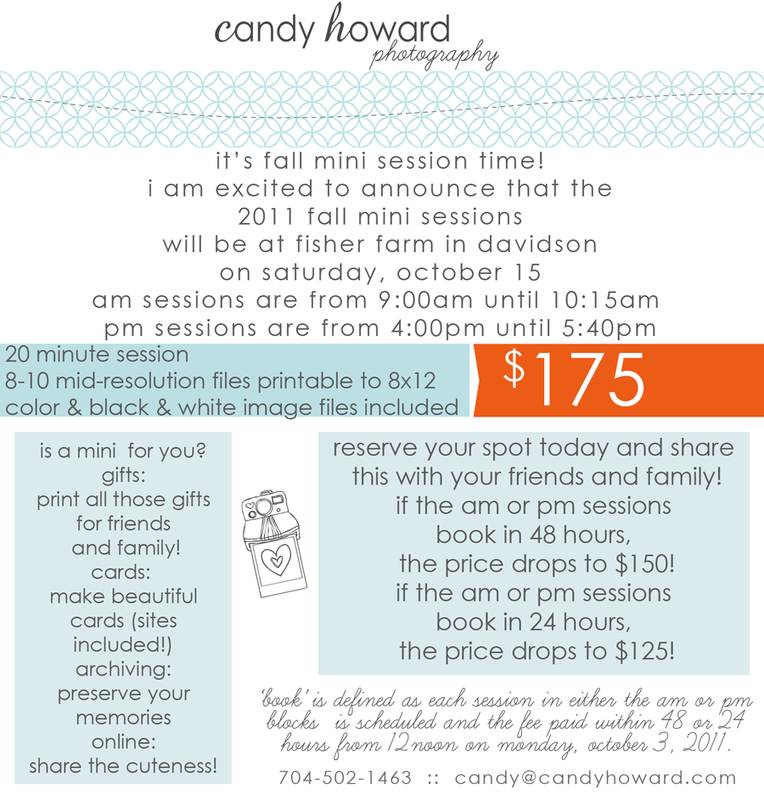 This is a special holiday mini session rate and does not apply to other purchases. I can't make it on that day. Can you do another one? Yes! I offer mini sessions year round for $200. Please let me know if you have any questions that were not addressed. 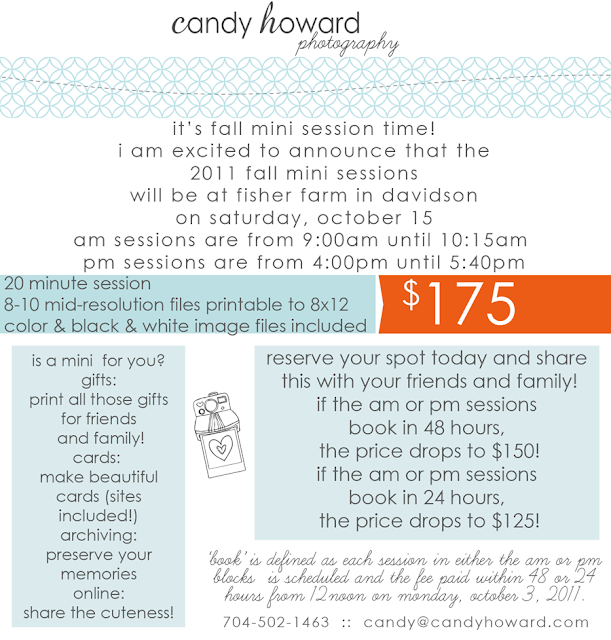 candy (@) candyhoward.com or 7040-502-1463. Thanks!